Then they both admitted that they don’t own guns, nor do they want to. I never would have guessed that. Harley riders have a saying about why they ride Harley Davidson motorcycles. They state that if you have to ask, you wouldn’t understand. The choice of guns and accessories can be discribed much the same way, but this got me thinking to myself: if I were to answer their question, how would I make them see just why we need such weapons and magazines, beyond the simple answer that it is my right and desire to own such items. My mind went back to 1992. I was living in San Diego, California in April of 1992 when the L.A. Riots broke out. 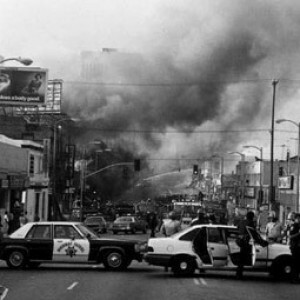 While many may have known tensions were high, not many foresaw the acquittal of the officers allegedly responsible for the Rodney King beatings. No one foresaw the riots to come. Now as I mentioned, I was in San Diego, not Los Angeles, but the tensions were spilling over South of L.A. as well. The day the riots started I remember looking out my upstairs bedroom window at the courtyard below filling with people angry about the judge’s ruling on the matter. There were at any given time 30-40 people shouting angry hatred towards “the man” and my race in general. Trash cans were thrown about the courtyard, arms waving, and there was more than one baseball bat held. I didn’t see any guns, but if I had to bet I would say that they were in the mix somewhere. I knew in my mind that if I set foot outside my door I would not last long among that mob. Please excuse me if this sounds politically incorrect, but it was not a good time to be a white man in Southern California. So I hid behind locked doors, wishing I had a gun – something to protect myself with and give myself a fighting chance. If the mob outside turned unruly and decided to make an example of me by breaking through my sliding glass door, I wouldn’t have a chance. A 911 call would have been useless. Thankfully, the mob outside burned off their steam and eventually disbursed. San Diego didn’t see the level of violence that Los Angeles did, but who is to say what might have triggered the next level of chaos? Looking back, the one thing I would have really liked to have, and potentially NEED, would have been an AR with a 30 round magazine. If they had decided to attack as a mob, the last thing I would want to do is reload every five or ten rounds. Maybe it’s just me, I am funny that way. Now, the last thing I want this to be is a commentary on the rights or wrongs of what took place on those tension filled days in April, 1992. I certainly don’t want it to be about race. It’s about the right to defend yourself under ANY circumstance. How can a law be passed that says you have the right to defend yourself, but only so much. You can kill ten of your attackers, but then you have to give the 11th guy a chance. We never know what the next day will bring. One day the sun will come up and all is fine, the next day you might find yourself in the middle of a gang war, or the next protest on civil rights. Preppers consider the possibility of the power grid going out and mass chaos ensuing. Maybe it will be an economic crash that makes money worthless? We just never know if or when you might need it, but personally… I would rather have it and not need it, than need it and not have it. Let us know what you think on our Community Forum: Defending The Need for Assault Rifles discussion on the Community Forum.